Matthew Holzapfel pitches for Tri-Village in Monday night win over Ansonia. NEW MADISON – The Tri-Village Patriots won a slugfest over the visiting Ansonia Tigers in a Monday night non-conference game by a 19-13 score. Ansonia took an early 2-0 lead in the top of the first inning only to have the Patriots put six runs on the board in its half of the first to lead 6-2 after an inning of play. The Tigers score three in the top of the second with Tri-Village plating two runs in the bottom of the inning sending the teams to third with the Patriots leading 8-5. Ansonia would not score in the top of the third while the Patriots were adding two runs in the bottom of the inning giving the home team a 10-5 advantage. Ansonia battle back plating five runs in the top of the fourth to even the score at 10-10 with Tri-Village scoring a run in their half to lead 11-10 after four complete. Ansonia grabbed and 13-11 lead in the top of the fifth, a lead that would not hold up with the Patriots plating four runs in the bottom of the inning to lead 15-13. The Tigers would not score again on the night while Tri-Village was adding four runs to the board in the bottom of the sixth to seal the six run win. “We put a young kid on the mound tonight, a freshman,” Ansonia Coach Evers said of Colton Young. Ansonia accounted for 13 hits and five errors while Tri-Village was banging out 19 hits and committing eight errors. Cody Eyer tossed 3.2 innings for TV allowing 9-earned runs, giving up 11-hits and striking out four. Matthew Holzapfel went 3.1 innings on the mound for the Patriots giving up three runs, two hits and five walks while striking out four. Derek Eyer went 3-5 with two doubles and 2-RBIs. Cody Eyer was 3-4 with three stolen bases and a RBI. Josheph McCombs went 3-4 with two stolen bases, 2-RBIs and 4-runs scored. Dylan Finkbine was 3-4 for TV with two stolen bases, 3’RBI’s and 2-runs. Mason Sullenbarger went 2-4 with 2-RBIs and 3-runs scored and Lemuel Prieto was 2-4 with 2-RBIs. Tri-Village improves to 6-6 overall and remains at 3-3 in CCC play. 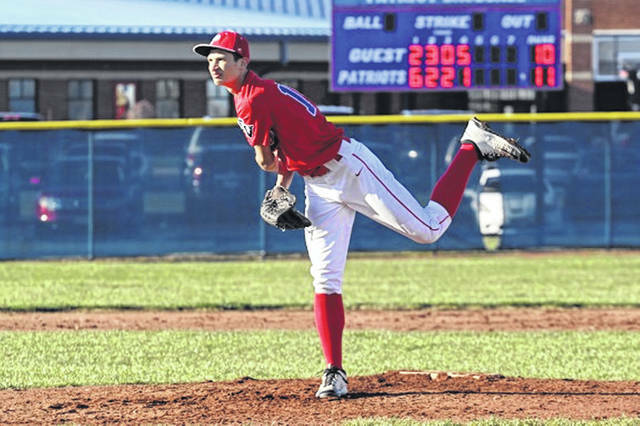 https://www.dailyadvocate.com/wp-content/uploads/sites/34/2019/04/web1_8-inch-Matthew-Holzapfel.jpgMatthew Holzapfel pitches for Tri-Village in Monday night win over Ansonia.